KENNEDY SPACE CENTER, FL--Catching a break from the weather, a United Launch Alliance Delta 2 rocket blasted off Saturday and successfully boosted two NASA science satellites into space on looping, round-about trajectories to the moon, the first step in an ambitious $496 million mission to map the cratered satellite's gravity and internal structure. By precisely measuring the distance between the two spacecraft as they orbit the moon -- and thus the subtle effects of the moon's gravity as they sail over visible and sub-surface geologic structures -- scientists will be able to determine the nature of the moon's enigmatic core and perhaps confirm or refute theories about how the moon formed some 4.5 billion years ago. "There have been many missions that have gone to the moon, orbited the moon, landed on the moon, brought back samples of the moon," said Maria Zuber, principal investigator of the Gravity Recovery and Interior Laboratory -- GRAIL -- mission. "But the missing piece of the puzzle in trying to understand the moon is what the deep interior is like. "Is there a core? How did the core form? How did the interior convect? What are the impact basins on the near-side flooded with magma and give us this man-in-the-moon shape whereas the back side of the moon doesn't have any of this? These are all mysteries that despite the fact we've studied the moon before, we don't understand how that has happened. GRAIL is a mission that is going to tell us that." It also may help inspire school kids to take more of an interest in science. Each satellite is equipped with four cameras sponsored by former shuttle astronaut Sally Ride's science education company that can be used by students around the world to photograph the lunar surface. "While GRAIL is performing its gravitational experiments, MoonKam will serve as eyes on the moon for Earth's students," said Leesa Hubbard, teacher in residence with Sally Ride Science. "And how they will do that is through the use of these cameras. "This program is available at no cost to schools, and students are going to be able to take their very own photos. This is what's going to make the difference. We know there are lots of images of the moon out there, but this gives students their own ownership of that." High winds aloft forced the NASA launch team to pass up two one-second launch windows Thursday and concern about a heater that ran longer than expected during detanking prompted another 24-hour slip. More high winds Saturday forced NASA to pass up the first of two more "instantaneous" launch windows, but a final weather balloon showed conditions were acceptable and at 9:08:52 a.m. EDT (GMT-4), the Delta 2 roared to life and vaulted away from complex 17B at the Cape Canaveral Air Force Station. It was the 110th and final planned flight of a Delta 2 from Cape Canaveral and while ULA has enough hardware on hand to build a final five medium-lift Delta 2s, any future flights of the workhorse rocket almost certainly will be launched from the West Coast. 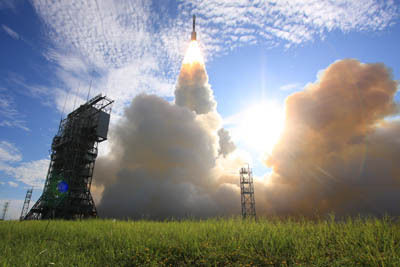 As such, the GRAIL launch marked the end of an era after more than 22 years of memorable Delta 2 flights, including 49 Global Positioning System navigation satellites and all of NASA's recent Mars missions, including the enormously successful Spirit and Opportunity rovers. Saturday's launching was virtually flawless and one hour and 20 minutes after liftoff, the GRAIL-A satellite was released from the Delta 2's second stage, followed a few minutes later by GRAIL-B. Both spacecraft will follow looping 2.6-million-mile trajectories to the moon, a low-energy approach that allowed the use of a less expensive, medium-lift rocket. "If you leave Earth and go barreling to the moon, you need a lot of fuel to slow down (and get into lunar orbit)," said Zuber. "We (wanted) to use small spacecraft with small fuel tanks. "So as a consequence of that, we use something called a low-energy trajectory where we go out to a point called the Earth-sun Lagrange point (a million miles from Earth). So we take three-and-a-half to four months to get the moon. In addition to saving fuel, what this allows to happen is these two spacecraft will arrive at the Moon on the same day no matter what day in the launch window we launch." The round-about journey also will allow time for the GRAIL spacecraft to "outgas," or lose trapped particles that might otherwise impart a small but measurable force on the satellites later that could be confused for gravitational effects. The flight plan calls for the GRAIL-A spacecraft to brake into an elliptical 11.5-hour orbit around the moon's poles on New Year's Eve with GRAIL-B following the next day. Over the next two months, flight controllers will carefully maneuver the two satellites into the same circular orbit at an altitude of about 34 miles. If all goes well, science operations will begin around March 8. Flying in formation at distances ranging from about 46 to 140 miles, the two spacecraft will send radio pulses and timing signals back and forth to precisely measure the distance between them. Sailing over buried mass concentrations, craters, mountain ranges, basins and other geologic features, the satellites will ever so slightly speed up and slow down, one after the other. The ranging system is accurate enough to detect differences of as little as one micron, or the width of a red blood cell. By carefully analyzing those changes, scientists can determine the distribution of mass within the moon to gain insights into its hidden interior structure and the nature of its core. "Grail, simply put, is a journey to the center of the moon," said Ed Weiler, NASA's associate administrator of space science. "It will probe the interior of the moon and map its gravity field 100 to 1,000 times better than ever before. We will learn more about the interior of the moon with GRAIL than all previous lunar missions combined." The satellites "will monitor the distance between each other and as the first satellite goes over a higher mass concentration, or higher gravity, it will speed up slightly. And that will increase the distance. Then as the second satellite goes over, that distance will close again. That's how it actually maps the gravitational field of the moon and it'll do that over the course of three months. And it'll do a complete map three times over those three months." The altitude and separation distance will be based on the size of features scientists plan to target. "The separation distance is what we call tuning for what wavelength gravity field you're after," said Sami Asmar, GRAIL deputy project scientist. "So if you want to see, gravitationally small features, craters, mountains, you want to be close to each other and low. But if you want to see global features, such as the core of the moon that we're after, then you want to be high and separate from each other." The three-month science mission is sandwiched between eclipses in December and June. The solar-powered satellites are not expected to survive the latter and flight controllers expect the spacecraft will lose power and eventually crash. But by that point, GRAIL's mission will be complete, and the results are expected to be a giant leap for lunar research. A major objective is to confirm or rule out theories about the moon's formation and evolution and, by extension, improve understanding of the early histories of other terrestrial planets. "We've used gravity science before to try to gain some insight as to what's going on inside the moon," said Asmar. "However, these have been very primitive attempts compared to what GRAIL will be able to accomplish. If those previous attempts could be likened to a magnifying glass, GRAIL, by contrast, would be a high-powered microscope." Researchers believe the moon formed at the dawn of the solar system when a Mars-size planet crashed into Earth, blowing off a huge amount of material that later coalesced to form the satellite we see today. Recent computer simulations suggest a second body, about a third the size of the moon, may have bumped into the still-forming world and stuck in place, explaining the rugged terrain seen on the moon's far side and the lack of magma-filled basins like those visible on the near side. The nature of the core is a major factor in the moon's evolution. Based on previous missions and on-going Earth-based observations, scientists believe the moon has a solid inner core, possibly surrounded by a liquid layer, a thick mantle and a relatively thin crust. But proving that is another matter. "We actually don't have direct evidence that the moon is made up this way," Asmar said. "So we're trying to answer the core question. ... If there's a liquid layer, it becomes a lubricant between two solid pieces and allows them independent motion. We can detect that by time-varying gravity, basically how the gravity field changes by a function of time." Along with shedding light on the moon's history, GRAIL also will help future spacecraft avoid unseen pitfalls. "Knowing the gravity field will allow future landed assets, manned, unmanned, to do that much more safely," Asmar said. "Sometimes below the surface there are mass concentrations. When you look at the topography, it looks flat and you'd think the gravity is average, but there's actually an embedded object beneath surface that would pull the landed asset and destroy it if it's not well understood in advance." Said Zuber: "On the moon, after GRAIL ... if you want to land right next to a particular outcrop, you're going to be able to do it. There will be no reason to do another gravity experiment to the moon in any of our lifetimes. If there's a particular sample return that we want to do, a particular reconnaissance in a particular area of the moon, you will be able to go exactly there and get it done."